When the first Swedish colonists arrived Saturday July 23, 1870, (sooner than the State expected), they found only six log cabins ready of the twenty-five that the State had planned. The supplies were put in one, and the colonists in the other five. Each family was to receive a cabin and 100 acres of forest with five acres cleared (160 acres had been offered to American homesteaders, with few takers). Funeral services were held Sunday for the baby who died enroute. On Monday the land was apportioned by allowing groups of four families, who were generally from the same province, to draw a block of four adjoining lots. Each of the four families then drew for one of those lots, and the homes were built where the lots came together for mutual support and socializing. The one and a half story homes of peeled logs were 18 by 26 feet, with a large general room, a small bedroom and a smaller pantry downstairs, with sleeping space above. The State provided a Hampden cooking stove. The colonists promptly went to work, clearing land and building homes, as well as building roads for the state (with Jacob Hardison in charge) for which they were paid one dollar per day in credit at the Colony's storehouse. It was already late in the year, but two acres of turnips were planted and harvested by November, and 16 acres of winter wheat and rye were planted. By late fall of 1870, other immigrants arrived and the colony had increased to 114 Swedes, and 26 houses had been built. A large public building was built by the Swedes to receive the new immigrants and serve as a supply house, a meeting place, a school, and a church. It became the heart of the Colony. The building was called the Capitolium by the Swedes, or the Capitol. Potato harvesting by hand using baskets, barrels and horse-drawn digger in the mid-1900's?Oh my aching back! In November Thomas distributed 34 land certificates which could be exchanged for deeds in five years after settling duties were fulfilled. Winter jobs were found for single men on nearby farms and lumber camps, while those remaining in the Colony went to work making hand-shaved shingles, a common medium of exchange at that time. The Swedes also made and first introduced to America what they called skidor, or Swedish snowshoes, what we now call skiis. How that simple item, common in Sweden at the time, has blossomed in America! By February 1871, the Colony was successful enough for the Legislature to appropriate another $25,000. To recruit more immigrants, a Cirkular was printed in Swedish and distributed in Sweden, it was also reproduced in Amerika, an emigrant newspaper. It was much too successful! They came by the hundreds. Thomas couldn't handle such an influx and tried to slow it down. While more lots were being laid out in the Colony, he diverted large groups to Kingman to work in the tanneries or peeling logs, and others to work on the European and North American Railroad. Thomas advertised "Anyone in Maine wishing laborers of almost any kind can be supplied." Some struck out on their own to work elsewhere (some never returned), or settled the outer Colony. 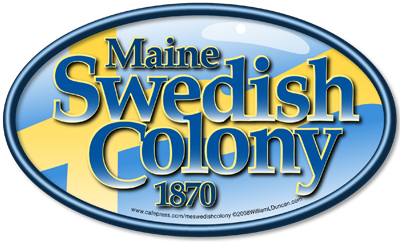 Some Swedes who had already gone west or south now wanted to come to Maine, and all the publicity resulted in more Americans coming to Aroostook. 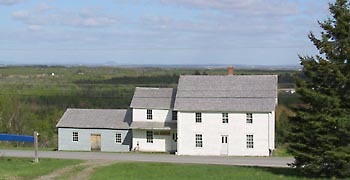 Albe Holmes came from New Hampshire and started the first Aroostook starch factory in Caribou. Starch became a major industry with several factories in New Sweden. The Caribou newspaper North Star carried a "Swensk Column" in Swedish in 1872-73. 300 Swedes came in 1872, bringing the total in the state to 1300. Next year, there were 1500 in Maine, with 600 in New Sweden. 2200 acres had been felled and 1500 nearly cleared. Thomas felt that his mission was accomplished so he recommended that state aid cease and the work of his office be turned over to the Land Agent, Mr. Burleigh. A typical one-room school. Note double desks and hanging kerosene lamps. 1874 was a difficult year for the Colony. There were forest fires, a poor growing season, a worse harvest, and state aid was cut off. There was much negative publicity. The Land Agent and Pastor Wiren conducted a survey which concluded that most of the charges were false. That survey gives us a good picture of the colony at that time. A group of Editors surveyed the Colony in 1878 and found it successful and prosperous. In 1876 the first Swedes were naturalized as Americans and the colony was organized as a Plantation, which permitted self-government. In 1895 the Town of New Sweden was incorporated. That was a great year for New Sweden, and it celebrated with a 25th Anniversary bash. At that time, the population was 717, 279 in Woodland, 103 in Caribou, 79 in Perham, 109 in Westmanland, 151 in Stockholm, 8 in T16-R4, for a total of 1452 in the Colony, and an estimated 3000 in the state. The Nine Governing Districts and the "B&A"
The Colony was so spread out over the township that districts were established for road maintenance and schools. These nine districts were used for governing before 1876. Representatives were chosen at a general election, with Pastor Wiren in an exofficio position. As one-room school houses were built in each district, they assumed names such as: Capitol, Center, East Road, West Road, (B&A) Station, Jemtland, Lebanon, Madawaska, East Jemtland. Economic expansion came when Bangor and Aroostook Railroad (B&ARR) was extended from Caribou to New Sweden and Stockholm in 1899. Potatoes and wood products were shipped to new markets. Railroad sidings, potato houses, and mills were built. Wherever there was a brook, a shingle, starch, grist, or saw mill might develop. If it was successful, it might attract a store or boarding house. Near the Capitol, the first commercial store was probably that of C.F.A. Johnson later taken over by Sawin & Teague, another by Axel Tornquist later sold to Bernard Pearson.The postmasters at the Capitol were Capt. Clase, Abia Wiren, Axel Tornquist, and Bernard Pearson, from 1873 to 1914; that post office was consolidated with the one at the B&A Station. There were telephones in New Sweden well before most people had electricity. The telephone office was probably early-on in the Wiren-Pearson buildings, moved next door, then replaced by the current building. At the B&A, there was a hotel/store of F.S. Tibbetts/Aaron Anderson, and stores by Youngren, Tornquist, Hemberg & Pierson (later run by Benson, John Olander, Willie Johnson, Ray Geis, etc. ), John Olander (later Peter & Charlene Espling), F.S.Tibbetts/John N. Johnson/Bernard Pearson Ford Garage, potato houses, a starch factory, a creamery, etc. The postmasters at B&A were John Hemberg at his store, John Ringdahl in the old log Center School which he moved to B&A; the office remained there from 1914 to 1970; in 1919 Olof Anderson bought the building and his son Walter Anderson was named Postmaster from 1919 to 1958, followed by Hartley Nelson. Lars Noak(sson) Blacksmith and Woodworking Shop (2001). At the AVR Station, there were stores of Nils Olson (later John Bloomstrand, Edward & Alvah Espling), Carl Soderberg (later Uno and David Espling) with John Soderberg's garage behind; perhaps the first mill in New Sweden was built by C.A.A. Johnson on Nils Olson Brook, there was another mill by Lundvall, Nils Olson, E. Hedman, and N.Sundell; Gardner's steam mill (later sold to A.F. Ullrich) piped water across the road from a dam on Nils Olson Brook; later there was a starch factory there as well as one behind Youngren's store at B&A. Below: Goodwin's Mill, at the corner of present day Route 161 and the Goodwin Road, Woodland. John Ringdahl built a steam lumber mill on West Road (near Hicks) where they sawed the lumber for the McElwain House in Caribou. After that mill burned, Ringdahl built another on East Road (near Frank Nichols pond) and that operated for many years with several additions. There was also a mill and at least one boarding house on Beardsley Brook at the foot of Jacobson hill (a boarding house was later moved to AVR). The AVR railroad did not come to New Sweden until 1911, whereas the B&A came in 1899. In Jemtland, stores of L.P. Larsson (Axel Larsson, Everett Larsson, John & Lil Hedman), Jacob Hedman (store and post office at Rista Road and then at Jemtland Center in front of Peterson's Hotel, Peterson's shingle mill in West Jemtland (later by Jacob Hedman and H. Anderson, then moved and expanded by Hedman to include starch and saw mill at corner of East Jemtland Road), John Berglind lumber mill in West Jemtland, Lars Stadig water powered gang saw mill (later converted to foundry for making lath machinery), a Mr. Petterson tried a windmill to saw boards, Wallace's sawmill on Beardsley Brook at Rista Road (later combined with a shingle and starch mill run by a cooperative referred to as "the Bolsheviks"). Atwood Hackett said his grandfather Sumner Hackett purchased the Wallace shingle mill and was also co-owner of the Goodwin Mill in Woodland, with the mill on Rt. 161 and the boarding house/store on the corner of Goodwin Road. John Borgeson built a mill on East Road and later sold it to Iverson who operated it as a steam long lumber, shingle mill, and general store until it burned as a result of Martin Sundstrom's chopping fire which got out of control. Anticipating the coming of the B&A RR, Jacob Hedman built a lumber, shingle, and starch mill on Madawaska Stream near Connor . Unfortunately, the route was changed but the mills continued to operate for some time. The Osell family also ran a saw mill on the Lower Madawaska Road. From 1905 to 1908 there was a post office called Nelson at the Andrew Nelson farm on West Road, which also served Westmanland. Nils Olson was a Baptist lay preacher who came with the immigrants in 1870. Andrew Wiren was a Lutheran pastor who came in 1871 to serve as minister, teacher and colony leader. They first held their respective services in the Capitol. Congregations were organized a little later and the churches built. The Lutheran Church was dedicated at the 10th Colony Anniversary in 1880, the Baptist church was dedicated in 1883, and the Mission Covenant Church was organized in 1885. In the meantime, the Seventh Day Adventist Church (known as "Battle Creeks") were active for several years and had a church on Peterson's farm east of the telephone office, but it apparently died out before long. (The building was then reportedly moved to Madawaska Lake and used as a camp). The Young Women's Christian Temperance Union was active in both temperance and social affairs, but was opposed to dancing which was just catching on. The YWCTU faded out and was soon replaced by the Grange with Landgrane (he of many clever inventions) as Master. This lasted for many years. Covenant Church (2001). Times were pretty good for the farmers and others during and after World War I. There was an increased demand for food and relatively few men actually went overseas to war. But for some it was of course tragic. The Great Depression in the 1930's and 40's affected most towns in Maine, but perhaps less so in New Sweden where most families still lived on farms and raised their own food. Businesses died out, and school teacher salaries were cut, but at least most people had food and a warm place to live. Recovery did not come until World War II. During the war, people were involved in the services and in war work in the cities. Demand for potatoes and other foods was high and farmers made money for several years, but even that came to an end. In New Sweden, farming went into a decline as small farms became unprofitable because of expensive farm machinery. Farm work decreased and young people who went to war and to the cities did not return to small-farm life except for family visits. In the 1950's Loring Airbase was built in Limestone and the economy picked up again. Larsson/Ostlund home, the only two-story log home in Maine from that era, c.1871. A few people living today remember the Depression, and fewer still the good times before that, while many more remember World War II. Up to that point New Sweden had remained a (primarily horse-drawn) farm economy, but then mechanization took hold. Trucks, tractors, snow plows, cars and garages became more common. Among the automotive servicing and filling stations which developed: F.S. Tibbetts/John N.Johnson, one of the first Ford dealers in Maine in early 1900's; Axel Johnson sold cars from his farm in Lebanon; Walter Hedman had a garage in Jemtland, built radios, and was a musician; John Soderberg's garage near AVR station; Harvey Hall worked for others and a garage near AVR; Bill Pude garage at B&A; Roland Tidd, Gunnar Sandstrom, Twin Michaud, Francis Anderson in Stockholm. The F. S. Tibbetts Hotel and store near the B&A Station in New Sweden. Henry Anderson's Kaffe Stuga filling station, store and cabins started out on Capitol Road and moved to 161 when road changed?then Joe Davis, Art Cullins, Steve Reed, Gary Raymond, a group from away, George Plourde, Cora Dube, David Anderson. Reinold Nelson and Ralph Nelson in New Sweden and Caribou; Johnny Johanson's machine shop, blacksmith, and garage on Madawaska Rd. ; Edgar Olivenbaum worked for others; Norman Engstrom in New Sweden and Caribou; Laurice Erickson in Stockholm, New Sweden and Caribou; Phil Bourgoine, Basil Ferguson in Jemtland and Caribou; Clifford Peterson, Eddie Peters garages in Jemtland; Dennis Anderson, Mike Hewitt garages in New Sweden, Phil Ketch in Woodland, currently. Older stores changed hands, and a few businesses sprang up. The Bloomstrand store went to Edward and Alvah Espling. Alwin Espling ran a business in the old AVR station and also on Jepson Road. Signe Espling and Frances Nelson then ran a bake shop at AVR. The Benson store at B&A went to Willie Johnson, then to Ray Gies, then Milo Haney (when it burnt down). By then, all of the other grocery and general stores in town were out of business except for the Larsson store in Jemtland (after Everett Larsson, to John and Lil Hedman) and the successor to Kaffe Stuga on 161. Some will remember other businessmen: Nils Grill (carpenter and watch maker), Clifford Anderson (hens), Wesley Johnson (hens), Jacob Hedman (hens), Hicks Insurance, A.Forrest and Keith Nelson Insurance, Frank Nichols (sign painter, etc. ), Steve Boody (organ pipes), Jimmy's chain saws, Mike Holmquist (woodcraft and bowls), and many others. Woods workers as well as buyers, shippers, operators and workers in potato houses would produce another list. Now the communities are primarily retirement and bedroom communities, proudly preserving their heritage and culture.